Nineteen-year-old Nargis from Quetta city in Pakistan became the first Pakistani woman to win a medal in karate at the 2018 Asian Games. “Papa, I did it”, Nargis exclaimed in a video message, raising her voice and her fist. Her victory is a symbol of empowerment for the women of Balochistan province who are bravely pushing the cultural and traditional barriers. “I have proved that girls from Quetta can participate in international sporting events,” she said. The teenage sports star won a bronze medal in karate at the 18th Asian Games which took place in Indonesia as she beat Nepal’s Rita Karki 3-1 and claimed the medal in the +68kg event. “I expected to win the medal, and all my friends and my coaches had expectations,” Nargis said in her media statement. Officials from Nargis’s home province sent their best wishes. Balochistan Chief Minister Mir Jam Kamal Aliyani had said that Nargis brought fame to Pakistan by demonstrating her talented skills at an international sporting event. He even stated that the youth of Balochistan has immense potential and skills. 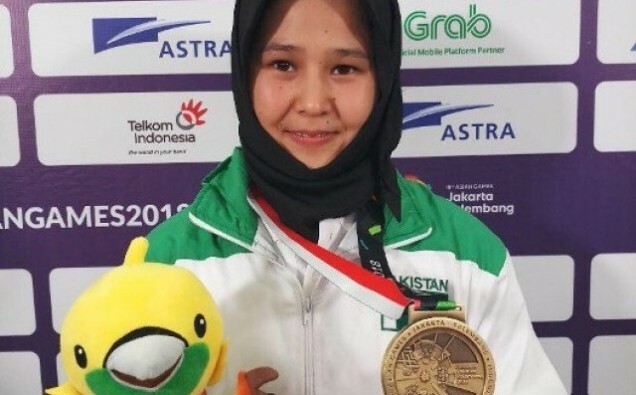 Nargis, from Quetta’s minority Hazara community, is now following in the footsteps of Kulsoom Hazara, who is Pakistan’s karate star who has represented the nation by competing in international events and won several gold medals.